Family of Pedals of a sine curve. The idea of positive and negative pedal curves occurred first to Colin Maclaurin in 1718; the name “pedal” is due to Terquem. The theory of Caustic Curves includes Pedals in an important role: the orthotomic is an enlargement of the pedal of the reflecting curve with respect to the point source of light (Quetelet, 1822). (See Caustics.) The notion may be enlarged upon to include loci formed by dropping perpendiculars upon a line making a constant angle with the tangent — viz., pedals formed upon the normals to a curve. Pedal and negative pedal are methods of deriving a new curve based on a given curve and a point. 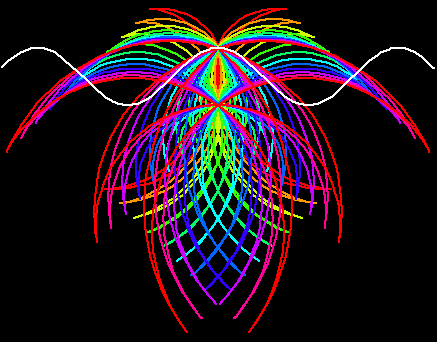 Given a curve and a fixed point O. Draw a tangent at any point P on the curve. Mark a point Q on this tangent so that line PQ and line OQ are penpendicular. Repeat step (2) and (3) for every point P on the curve. The locus of Q is the pedal of the given curve with respect to point O. A pedal of a sine curve with respect to a point below the curve. This is one of the curves shown in the figure at the top of this page. Pedal and negative pedal are inverse concepts. Negative pedal of a curve C can be defined as a curve C' such that the pedal of C is C'. Give a curve and a fixed point O. Draw a line from O to any point P on the curve. Draw a line perpendicular to line OP and passing P.
Repeat step (2) and (3) for every point P on the curve. 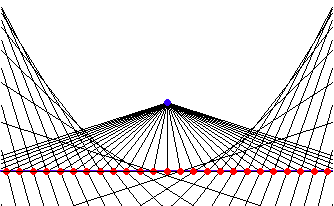 The envelope of lines is the negative pedal of the given curve with respect to point O. 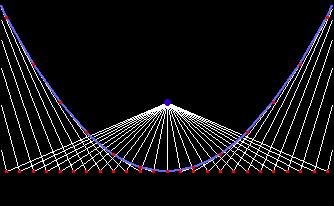 The pedal of a parabola with respect to its focus is a line. The negative pedal of a line is a parabola.